I love to read for the escapism as well as to learn to be a better writer myself. This page is where I'll share books I read and loved! One of the BEST Fantasy series EVER! 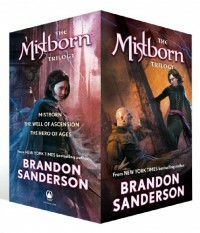 Brandon Sanderson is my all time favorite author because of this series. After reading the last word, I closed the book and just sat in stunned awe. I didn't expect that ending. I won't get too in depth in this review because to do so would spoil it for other readers. This series has one of the most incredible worlds and an amazing magic system. The fight scenes are epic! I loved Vin, Kelsier, Sazed, and the whole team. Sazed was, without a doubt, one of my most favorite characters because I empathized with his "what to believe" struggle. I went through it myself. This series has some of my favorite quotes. The writing is flawless. If you love fantasy, you will love this trilogy.